A beautiful day in the alpine on an easy and short climb in the Tatoosh. Weather: Sunny 60 degrees with clouds moving in late in the day. Winds light increasing in the late afternoon. Just one of those awesome days in the alpine. Great conditions and great people always make a trip run smoothly. We left the trailhead at 8:00AM. We started out at the Snow Lake trailhead and followed the sporadically melted out summer trail. We were finally on consistent snow between Bench and Snow Lake where we headed up the snow ramps to the ridge. The snow is melting fast and is quite soft. There was some post-holing as we passed Snow Lake, so exercise caution. We had two folks post-hole up to their mid-sections. We used the melted out steps of a prior group and easily made our way up the snow in the gully above Snow Lake. No crampons required. To achieve the ridge, there is a respectable moat developing that requires an awkward step-across and a 15’ right-traversing scramble just below the saddle where you hang left for the Unicorn summit block. (approx. : 46.744399, -121.703029) There are lots of slings attached to a tree at the notch where we stepped across if parties wish to set up a handline. With the melt out, we suspect this will widen significantly soon. We easily made our way across the ridge on snow to the base of the climb. The rock was warm and dry and the group quickly and efficiently set up the anchor and went up the middle 5.4 route. We lead the route once and belayed the rest of the group up. On the route down we opted to rappel over the moat which saved a lot of time since the rock here is wet and it seemed an unnecessary risk to have everyone downclimb into the moat. 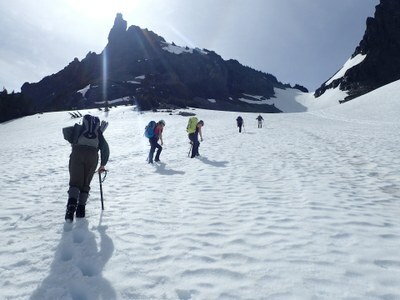 At the saddle we paused long enough to don our glissade wear and slid almost the entire snow ramp back to Snow Lake. The snow is wet and heavy so the glissades were slow and controlled. From Snow Lake we retraced our steps back to the car. We arrived back at the cars at 4:45PM. We had the entire mountain to ourselves all day, with the exception of some folks in blue jeans and tennis sneakers near the trailhead.